We watch the tragic toxic mass continue to grow, but scientists estimate that we are seeing only 2-5% of the oil. The rest remains below the surface and the damage will remain long beyond any eventual surface cleanup. On the links below we've posted over 300 photos and some videos taken in late May on our first visit to the Gulf. Sorry to be late with providing supportive text for all of the photos; as soon as we got back to California the necessities of earning our daily keep have taken most of our time and energies. We're headed back to the Gulf shortly, this time with better knowledge and planning, more equipment for aerial and marine documentation and searching, and some powerful talent. In the meantime, if you have any questions about where or when photos were taken, just ask; the info is is readily available, as we've kept good records. Probably what got us the most was the recognition of the thousands of breeding pairs of pelicans, egrets, and more on the Chandeleur islands, now with hatchlings. 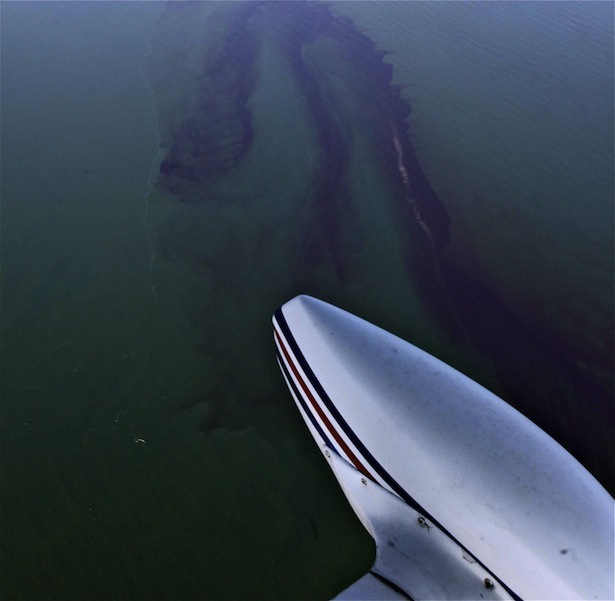 They hunt/fish together along the lines between the oil slicks and less oily water. 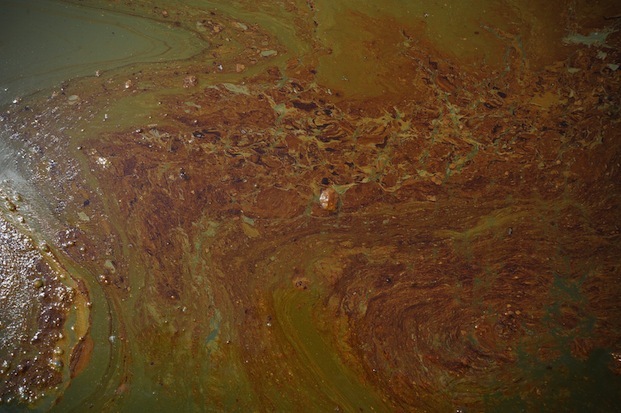 Having seen some of those oiled fish wash up on shore, filled to the gills with oil and sludge, it becomes clear that the most tragic impending doom is not just a few oiled feathers -- it is the certain permanent and lethal damage to the entire populations from eating oiled and contaminated fish. Zoom in on some of our photos and see the animals, see the oil and dispersant coming right up to the surface absorbent booms surrounding some of those islands. Browse the photos and videos, and read more about some ideas we have to help with this! We'd love to hear your ideas and comments, too. 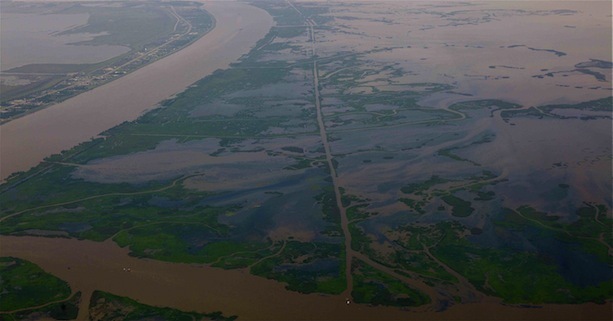 We arrived in New Orleans on Sunday May 23, and immediately began a series of aerial surveillance flights covering most of the shore areas as well as the Chandeleur Islands. See photos, videos, and blog at Blog from Gulf Trip #1. Despite the FAA-mandated Temporary Flight Restrictions (TFRs) which restrict flight to higher than 3000' agl (above ground level), by flying slowly with open window and long lenses, we obtained some good high-resolution footage of sensitive areas, and learned much about the numbers and conditions of wildlife in otherwise unreachable areas such as the Chandeleur Islands, Grand Isle, Barataria Bay, Venice, and the southern shores. The photos and videos speak for themselves. 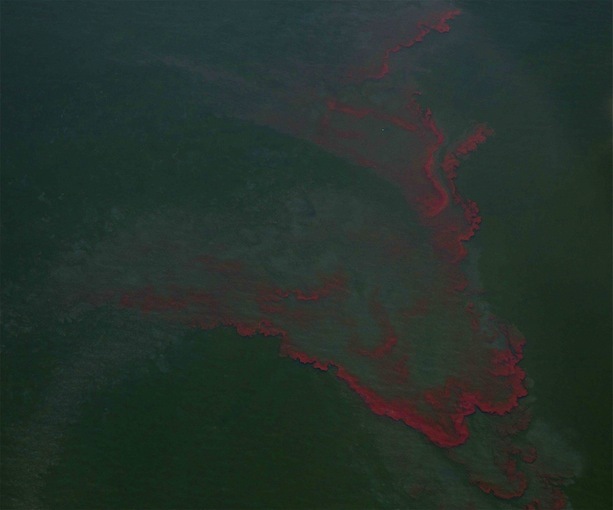 You'll see the sheen of oil and dispersant extending for miles in places and having found its way into the estuaries. 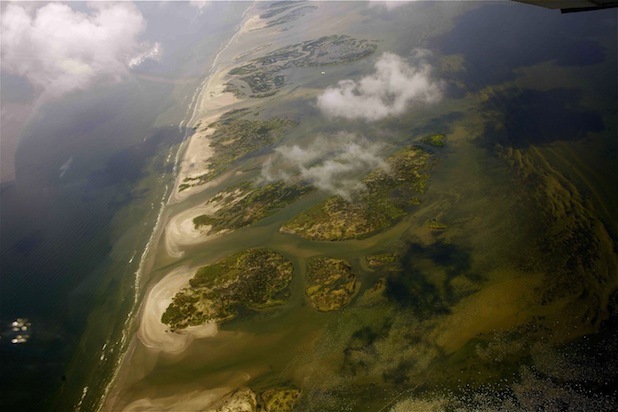 You'll see absorbent booms spread along shore areas and around the islands, and you'll see photos taken along Elmers Island and other shore areas showing boom that is full of oil and wrapped in bags to be removed. 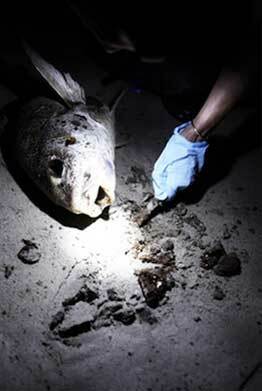 You'll see photos of some fish washed up along shore, such as a large bull red fish who had oil seeping out of his mouth and eyes; his gills were filled with the sludge shown in hands in a subsequent photo. 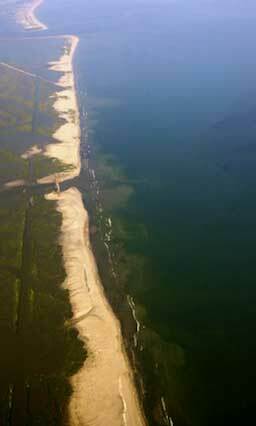 Where there are no boats or rigs in the photo to give you the scale, note that the sediment-filled water usually extends about 100 m from the shoreline. 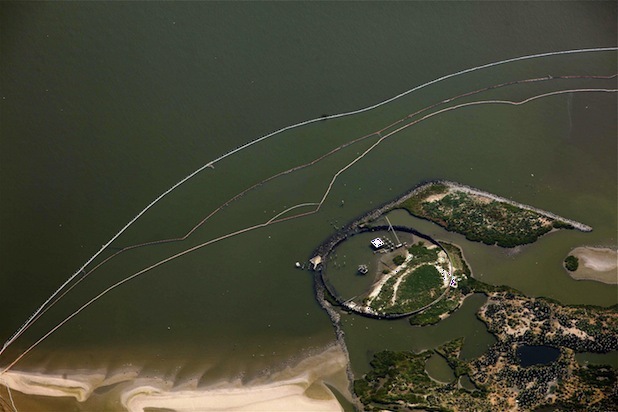 The oil/dispersant line is only about 300 m from the shoreline in many places, and the lines extend for miles. We also took boats out, thanks to some generous locals who donated their use as well as supporting equipment. We'll do more of that next trip, because we didn't get as far as we wanted or to the places we subsequently learned would have proven more fruitful. 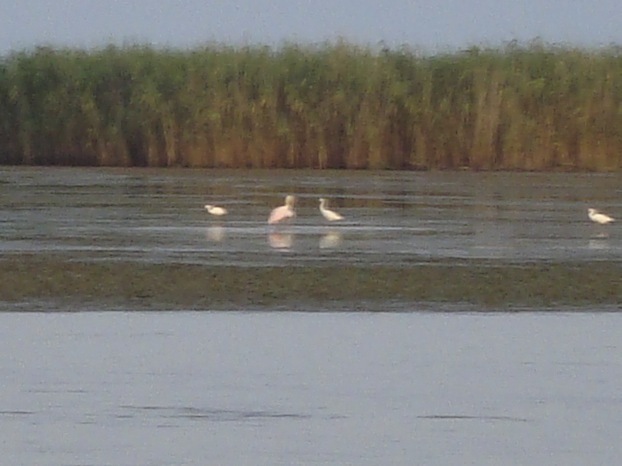 But we did get some wonderful footage of the local birds -- roseate spoonbills, egrets, herons, cranes, and yes, even a few alligators. We were amazed to see some shrimp trawlers still out there, apparently not for purposes of cleaning up oil or looking for wildlife. Needless to say, we wouldn't recommend eating any seafood in that area! Interestingly, on a boat trip from Venice toward South Bay we found two dead fish, non-oiled, who had had their rear quarters chewed off. Not by alligators, but what looked to be by sharks. Our biggest news so far came from surveying the Chandeleur Islands. (For details see Blog from Gulf Trip #1 There we found many hundreds of nesting birds sitting on hatchlings. 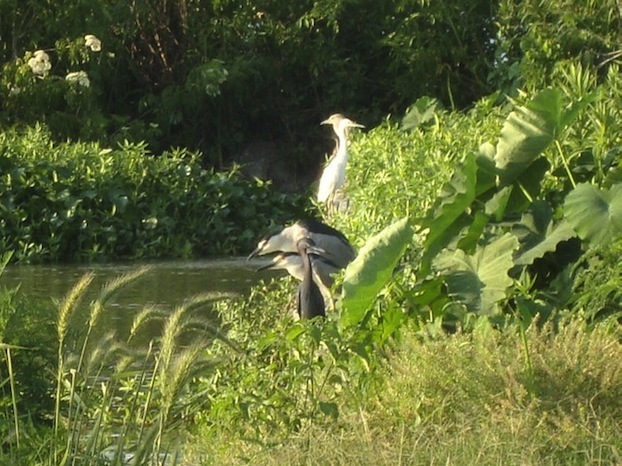 Brown pelicans, egrets, herons, and cranes. 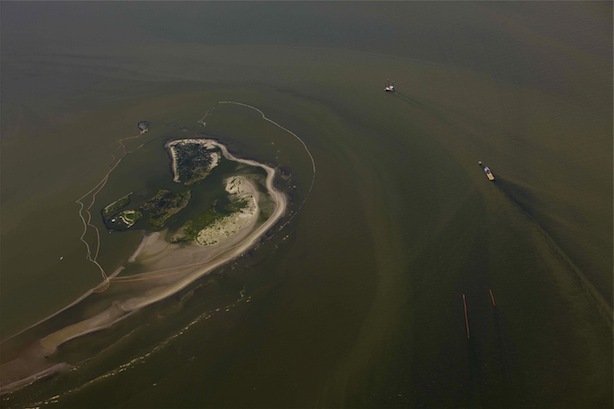 There were oil absorbent booms stretched around most of those islands, just off shore. The surface oil has come right up to the booms, and in some places the below-surface oil has made its way past the booms to inland pools. We saw several V's of birds 'fishing', right along what we began calling 'the line' -- that clearly visible line not far from shore where the red sheen begins. There's the horror -- worse than oiled feathers, these birds are dining on and feeding their young oil-contaminated fish, which will result in internal organ damage and eventual death. 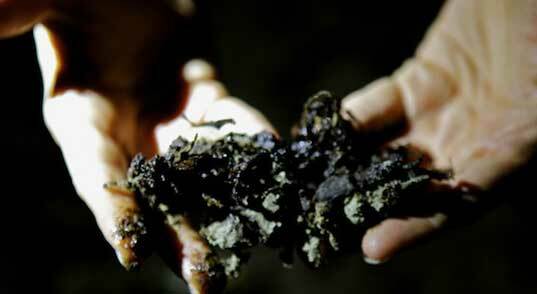 Components of the crude oil and the dispersant, which include benzene, tolunete, ethyl benzene, xylene, 2-butoxy ethanol, and more, are known carcinogens and serious hazards to most every part of a body -- eyes, skin, respiratory system, central nervous system, hematic sytem blood, kidneys, liver, and lymphoid systems. Exposure routes include all possible -- inhalation, absorption, ingestion, and contact.